A trailblazing winery is poised to take the next step thanks partly to help from the Small Business Mentoring service. Owners Sonja Herges and Paul Evans planted their Murrindindi vineyard from 1998-2002 and launched the Sedona label in 2005. They built their winery and cellar door from 2010-2012. 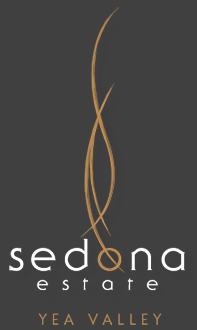 Sedona Estate Pty Ltd is now an exceptional vineyard and winery with two employees and casual vineyard and winery workers. Paul processes fruit grown on the property in the onsite winery. With mostly French and one Italian variety, his top quality labels include cabernet sauvignon, merlot, shiraz and sangiovese. Sedona Estate quickly became a tourist destination with a cellar door offering wine tastings, artisan food platters, winery tours, art exhibitions and biannual events. It is the first winery of this kind in the Yea Valley, but extensive marketing is required to attract wine lovers to this secluded vineyard surrounded by mesmerising views. Customers include restaurants, cafes, hotels, independent liquor stores, supermarkets, wine clubs, wholesale distributors and the general public. Products are sold locally, interstate and overseas. Sonja, who was born in Germany’s famous Riesling wine region, the Mosel valley, studied pharmacy there and completed a PhD in pharmacology (brain research) in Melbourne. She held various corporate medical positions in the pharmaceutical industry for 10 years until her passion for wine took over. Motivated by an urge to create something lasting, Sonja has worked with the business full-time since 2011. She focusses on marketing, sales and business development, while Paul runs the vineyard and winemaking operation. Paul and Sonja have created a special and popular business, which they enjoy running themselves. After deciding she wanted to prioritise for the next growth phase, Sonja sought independent help. She discovered SBMS through Murrindindi Shire Council and was matched with mentor Barbara Cox as part of the Women in Business mentoring program. Barbara is a management consultant with varied experience and a focus on strategic and business planning, leadership and management development, human resources policies and procedures, facilitation, coaching and training. Sonja had six sessions with Barbara over six months. “In particular, Sonja was interested in help in two areas, strategic planning and financial analysis,” Barbara says. “Sonja has an excellent business mind and is on top of most areas of her business. Strategic planning helped her to focus on the key issues and prioritise her activities. “It was also helpful for her to have someone with whom she could talk over her ideas and get a feel for what would work. The mentoring helped Sonja improve her organisational skills and give her a good feel for her time limitations and the need to make choices about where to spend her time. “Sonja has learned specific skills from the Women in Business program, particularly in the area of strategic planning and prioritisation,” Barbara says. Sonja says being able to better prioritise had reduced stress. Two key areas were also identified for the next growth phase, including a Sydney wholesale distributor and building exports. “Preliminary research has been conducted for both areas, which also led to a one-off export opportunity,” Sonja says. Due to limited resources, Sonja chose to focus on the Sydney distributor and continue developing the Sedona Estate brand, building on momentum generated by excellent wine reviews. Export opportunities will be explored in the long-term. Since seeing Barbara, profits have increased by about five per cent and the export opportunity to China arose. “With no prior experience, it was extremely helpful to have the support from Barbara … to work through the ‘process’ and make smart business decisions,” Sonja says. “It prompted me to renew the export licence for Sedona Estate and to gain experience in the Australian regulatory process for export product registration.